There is something so futuristic about galaxy prints that makes you wonder "Is this what fashion will involve into when mars or some other planet becomes our new home?" Probably. But why wait till then, when Christopher Kane is bringing the future back to you while we're still on earth! Galaxy prints have taken most high-street brands by storm and it's Kane's resort collection which has inspired this change. I pretty much love the entire collection but these would be my favs. Oh, and check out those shoes. Fancy stuff. Kane may not be the most popular kid in fashion town but his work is original and creative. The silhouettes are quite simple and basic but the print makes it larger than life. His ability to play with prints has made him what he is. So buy one yourself and don't worry you won't look like one of the Jetsons. 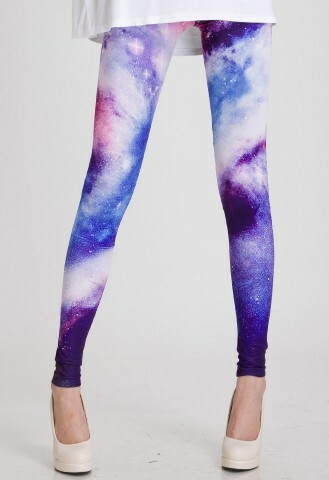 Make your own galaxy print leggings! CLICK HERE to DIY!